Sprint today announced that both the HTC EVO 3D and EVO Design 4G will be updated to Android 4.0 Ice Cream Sandwich starting in early August. Users will be notified automatically when the update is available to their device. The update can be downloaded and installed over the air. Sprint expects the update to take several weeks to reach all users. HTC today published in a blog post a list of 16 smartphones that will be updated to Android 4.0 Ice Cream Sandwich. The devices include the Amaze 4G, Desire S, Desire HD, EVO 3D, EVO Design 4G, Incredible S, Sensation, Sensation XL, Sensation 4G, Sensation XE, Raider, Rezound, Rhyme, Thunderbolt, and Vivid. HTC said that it is still in the early stages of rolling out Android 4.0 to the Sensation and Sensation XE. The next phones in line for Android 4.0 updates are the Sensation 4G and the Sensation XL. HTC cautions that wireless network operators play a role in the update process, so it can't lock down firm timelines with respect to the exact availability of updates. HTC today provided more details via its Facebook page on when it will update its existing smartphones to Android 4.0 Ice Cream Sandwich. The first batch includes the Sensation, Sensation 4G and Sensation XE by the end of March, with the Sensation XL soon after. HTC says that owners of the Rezound, Vivid, Amaze 4G, EVO 3D, EVO Design 4G, Incredible S, Desire S, and Desire HD will receive Android 4.0 later this year. HTC will provide more specific details about the upgrades in the coming weeks. Following HTC's announcement earlier today, Sprint confirmed via its community support forums that it will update the HTC EVO Design 4G and the HTC EVO 3D to Android 4.0 Ice Cream Sandwich in early 2012. Sprint said that Android 4.0 will be pushed out to these devices over the air. It also said that Android 4.0 will be available to "other key products in our line-up." Sprint said that more information will be provided in due time. HTC has added the tools necessary for owners of the HTC EVO 3D to unlock their bootloader if they so wish. The tools are available from HTCdev.com, HTC's developer web site, which also explains how the update process will work. Owners of the 3D wishing to unlock their bootloader will first need to update the system software on their device. HTC cautions that users who unlock the bootloader of their device will void the warranty. Skype has provided an update to its Android application that adds the video chatting feature to a large number of new Android handsets. Skype notes that Gingerbread is required to use the video chat feature, so owners of the following phones are encouraged to make sure their system is up to date. The new handsets are: the Acer A5; the HTC Desire, Thunderbolt, Sensation, EVO 4G, EVO 3D, Incredible S, Desire HD, Flyer; the LG Revolution; the Samsung Galaxy S, Galaxy S II, Droid Charge, Galaxy Tab; and the Sony Ericsson Xperia Play, Xperia ray, and Xperia mini pro. The update is free to install. Sprint today announced that it has added its WiMax 4G network service and device portfolio to the list of wholesale products it offers. Sprint already allows other companies to resell its 3G wireless services and handsets. Sprint believes the addition of 4G to its wholesale offering will give companies the flexibility they require to meet their customers' needs. Sprint says that the wholesale customers can resell Sprint devices such as the HTC EVO Shift 4G, the Sierra Wireless 250U 3G/4G data card. Other 4G devices will become available in the coming months. Sprint notes that WiMax is now available in 71 markets around the country. Sprint today announced the availability and pricing details for the HTC EVO 3D and EVO View 4G. Both will become available starting on June 24. The EVO 3D will cost $199.99 and requires one of Sprint's Everything Data plans plus the $10 Premium Data add-on charge for smartphones. The EVO View 4G will cost $399.99 and Sprint is offering a variety of 3G and 4G data plans for it. Sprint stores will open at 8 a.m. local time on the 24th, and customers can pre-order the EVO 3D with the purchase of a $50 Sprint gift card. Sprint premier customers will be able to purchase the EVO 3D online starting June 21 ahead of the retail launch. The Federal Communications Commission has approved the previously announced HTC EVO 3D for the Sprint network with an interesting and unannounced spec. The FCC has confirmed that the EVO 3D supports 800MHz CDMA in the ESMR band. The ESMR 800MHz band is what Sprint uses for its iDEN network. Sprint eventually plans to transition the ESMR band from iDEN to CDMA as part of its expansive network improvement initiative. Once that transition is complete and Sprint ports its voice services to the ESMR spectrum, the HTC EVO 3D will be able to make use of it. Sprint's main CDMA network operates in the 1900MHz PCS band. HTC has confirmed via one of its official Twitter accounts that its new Sense 3.0 user interface overlay will not be made available to devices that are already in the market. It will debut on the EVO 3D, Sensation 4G, and View 3D (Flyer) tablet, but will not work on older HTC phones. 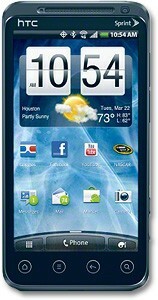 HTC is prepared to reveal an updated version of its Sense user interface overlay in the coming days. According to AllThingsD, HTCs goal with the new Sense is to make some tasks easier and/or take less time to accomplish. First, HTC is changing how the lock screen works, which includes giving users the ability to jump to certain apps, such as email or the camera, directly from the lock screen. The lock screen can also be set to display users' photos or the weather without the need to fully unlock the device. Other changes cited by AllThingsD note that Sense will allow HTC phone users to silence calls by turning their phone over, and it will also make use of light sensors and ring louder when low light levels suggest that the phone might be in a pocket or purse. It can also take advantage of the accelerometer to quiet the phone once the device senses that it has been grabbed. Another tweak being made by HTC is to reduce the shutter lag so that people may take pictures faster. 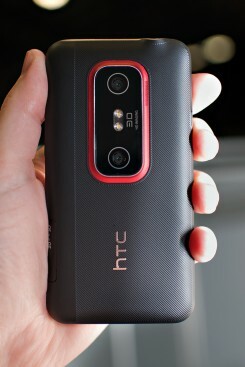 The HTC EVO 3D, headed to Sprint later this year, will be the first handset to have the latest version of Sense. Sprint and HTC today announced the EVO 3D, a follow up to the original EVO smartphone that adds 3D picture-taking and video-capturing abilities. The EVO 3D has a qHD (960 x 540) 4.3-inch display, runs Android 2.3 and has HTC's Sense user interface overlay. It has dual five megapixel cameras with autofocus and dual LED flash, as well as a 1.3 megapixel user-facing camera. The main camera can capture 3D still images, and 720p HD 3D video. It can display both types of 3D content on the handset without the need for glasses. It is powered by a 1.2GHz SnapDragon processor, and runs on both Sprint's EVDO 3G and WiMax 4G networks with support for mobile hotspot (up to eight devices). HTC has upped the size of the battery from the original EVO's 1500mAh to 1730mAh. It also has 8GB of on-board storage (expandable up to 32GB), Wi-Fi, Bluetooth, and HDMI. It goes on sale this summer. Pricing has not been announced.